A view from the cycle path: A Toot and a Wave. 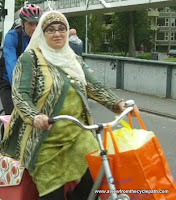 Dutch cyclists are not an out-group. Car horns are not used as weapons. A Toot and a Wave. Dutch cyclists are not an out-group. Car horns are not used as weapons. I still tense up a little if I hear a car horn when cycling. I still glance around for escape routes. This is a learnt behaviour which comes from many years of cycling in Britain, where car horns are used quite often by drivers to send an unpleasant message to cyclists supposedly committing some ill or other. The sound of a car horn would commonly be accompanied by that of squealing tyres, a revving engine or abuse through a car window. None of those things has happened to me in six years of living in The Netherlands, but I still cringe when I hear a horn. Still from the video showing "tooter" and "waver"
In The Netherlands, cyclists are not an out-group. That is to say that we're not an easily identifiable group on the edge of society. Because cyclists are not an out-group, we don't suffer from homogeneity bias where each member of a group are blamed for behaviours which part of the group may have. There is no discussion here about "cyclists" going through red lights, riding on the pavement etc. Cycling is mainstream here. 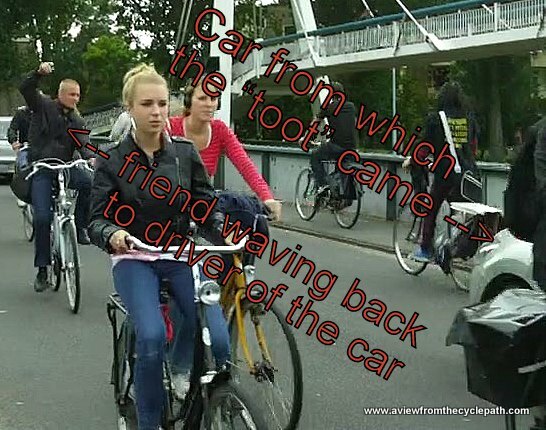 There is no "us vs. them" antagonism between drivers and cyclists because the same people ride bikes as drive cars. people often make this argument. seen cycling in The Netherlands. in the background of this still. Of course, that's not to say that there is no bias in The Netherlands, nor that everyone is fair and rational. I made this video during a Study Tour a few weeks ago. A little before we reached this point and while we were observing another location of interest in Groningen, a woman come up to us with a complaint. The growing collection of teenagers' bikes which we were admiring outside a football ground caused her discomfort. To her, the collection of "scruffy" bikes lowered the tone of this respectable neighbourhood. Why couldn't the teenagers park their bicycles a few hundred metres away in the secure cycle-parking facility provided by the council ? Of course the reason the answer to this was in her question. The secure cycle-parking facility was a few hundred metres away and the teenagers would have to walk. Everyone likes convenience. I suspect that includes the woman making the complaint, who was astride her own bicycle as she spoke to me. The out-group in this case was not "cyclists" but "teenagers". It is often the case that the behaviour which motorists and pedestrians complain about in other nations is actually teenage behaviour. For instance, when cycling is banned in a pedestrianized area, the only cyclists who will remain are those who are scoff-laws. Often they are teenagers. Teenagers push the boundaries of acceptable behaviour. That has always been so and it always will be so. The more that cycling is normalized, the more it is that teenage cyclists will follow the norms of behaviour which the majority follow. 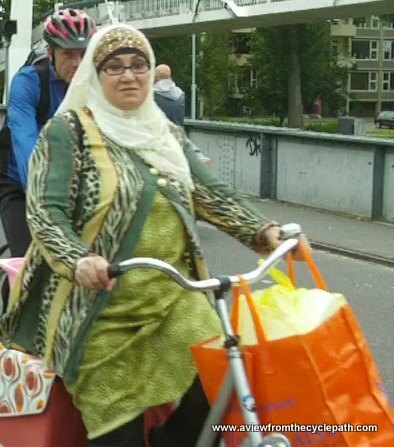 The rise in cycling in The Netherlands came about due to normal people campaigning for safety. This campaigning which was inclusive of the population as a whole and not just for the benefit of a vocal minority. Cycling is not a revolutionary activity in the Netherlands. Long may this remain so. People sometimes wonder why it is that we operate Study Tours and what we have to offer that a Dutch person does not. The experience of having living and cycled for many years in less cycling friendly countries gives us perspectives that people who have not done this simply cannot have. See also my other blog post from today about an excellent dynamo lighting special offer.